According to the most recent Employment Situation Summary released by the U.S. Bureau of Labor Statistics, the nation added jobs during the month of May, despite a slight increase in the overall unemployment rate. 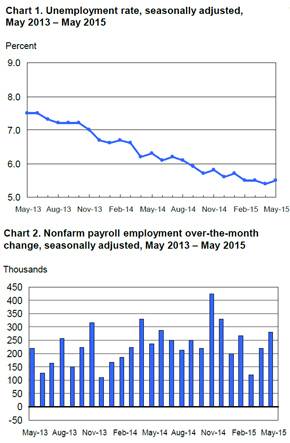 Overall, total nonfarm payroll increased by 280,000 positions in May, compared to a growth of just over 250,000 jobs in April. From an industry perspective, the most gains were seen in the professional and business services field, which added 63,000 jobs. Within this sector, the areas that saw the largest increases included computer systems design and related services, temporary help services, management and technical consulting services, and architectural and engineering services. The leisure and hospitality field increased its workforce by 57,000 jobs in May, with nearly 30,000 of those positions coming from the arts, entertainment and recreation sector. Healthcare gained 47,000 positions, most of which were associated with ambulatory care services, including home healthcare services and outpatient care centers, and hospitals. The retail sector gained over 30,000 positions in May, with automobile dealers adding the most jobs in this industry, while financial activities grew by 13,000 jobs. Employment was relatively unchanged in manufacturing, wholesale trade, information and government, while the mining industry lost jobs for the fifth consecutive month. Even though the country added a significant number of jobs, the nation’s unemployment rate ticked up slightly from 5.4 percent to 5.5 percent. The number of employed people remained essentially unchanged at 8.7 million. The number of unemployed new entrants, or people who have never worked but are now attempting to enter the workforce, grew by 103,000 this month, contributing to a slightly higher jobless rate. Salaries increased in May, with average hourly earnings going from $24.88 to $24.96. In the past 12 months, hourly wages have grown by 2.3 percent. Average hourly compensation for private-sector production and non-supervisory employees increased by 6 cents to $20.97. The New York Times explained that this modest employment growth was an overall positive sign for the U.S. economy. The trade balance improved, shrinking by $50.6 billion. Additionally, the number of people applying for unemployment benefits has been on the decline, remaining around a 15-year low for the past 13 weeks. While household spending is still somewhat conservative, falling gas prices will likely encourage more people to loosen their budgets in the coming months. As a result of these positive indicators, the source added that analysts generally expect the Fed to be ready by its September meeting to raise its benchmark interest rate above zero for the first time since December 2008.